The Three-Part Harmony show will be on display at Studios on the Park in Paso Robles through Aug. 27. Catch an artists' talk with Colleen Gnos, Larry Le Brane, and Michael Reddell Aug. 5 at 6:30 p.m. The studio will also hold The Art of Music, which includes a presentation by Le Brane and wine tastings from Gary Kramer Guitar Cellars, on Aug. 18 at 6 p.m. Visit studiosonthepark.org for more information. Artist Colleen Gnos wants you to do something a little unusual. She wants you to see music when you look at her paintings. LOCAL SOUNDS SLO musician Erin Inglish is depicted in Colleen Gnos' painting, Will Not Obey. After the Shell Beach artist recently switched to a more abstract painting style, she'd start every painting with a colorful background, letting each dab and drip of the paint brush fall where it may. "They looked like music," Gnos, a lover of jazz, said. "They looked almost lyrical to me." It wasn't long before musicians with their instruments mid-performance were added atop those bold backgrounds. But good music is complex, with many parts, which is why Gnos invited fellow local artists Larry Le Brane and Michael Reddell to feature their work alongside her in the Three-Part Harmony exhibit that's currently on display at Studios on the Park in Paso Robles. "For me it's this full sensory experience," Gnos said of her new approach to painting. "Rather than being drudgery, it's creative always." 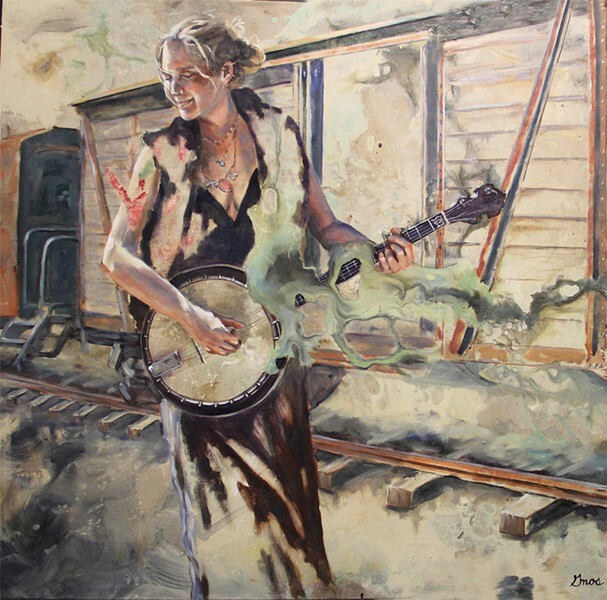 Many of her paintings feature local musicians, like Erin Inglish in the painting Will Not Obey, where Iglish is depicted playing the banjo in front of the railroad tracks. The mix of soft neutral colors with a splash of teal and blush is dreamy and Inglish's instrument sort of naturally melds into a steamy burst of color. "She's a special person to watch perform," Gnos said of Inglish. "She's so creative and so strong." Gnos' co-exhibitor Le Brane took a more literal approach to the show's theme, opting to present a range of sculptural pieces made out of different parts of the clarinet. Does the Los Osos artist play the clarinet? Nope, but the instrument's shape is straight and adaptable and it's relatively cheap to come by. Under Le Brane's vision, clarinets have new lives as fish, dancing shoes, cars, and even as gun-hybrids. In his piece, Turn Instruments of Rage Into Instruments of Joy, Le Brane combined a clarinet with a rifle, fused glass, air-gun parts, and a custom metal stand. "The clarinet is fascinating to me," Le Brane said. "It has a simplicity and complexity. There's so many things you can do with a clarinet if you don't know how to play it." WEAPON OF GOOD Artist Larry Le Brane takes different pieces of clarinets and sculpts them into other things, like a gun, in Turn Instruments of Rage Into Instruments of Joy. That left the muse of movement and dance for Redell to work with. The Cambria-based sculptor deals in stainless steel round bar sculptures. His pieces are filled with lines that look like someone tapped a detailed pencil drawing with a magic wand and turned into a three-dimensional creature. "I hate to draw," Reddell said. "Once I discovered this I realized it's like drawing, but in the dimension that I feel comfortable with." 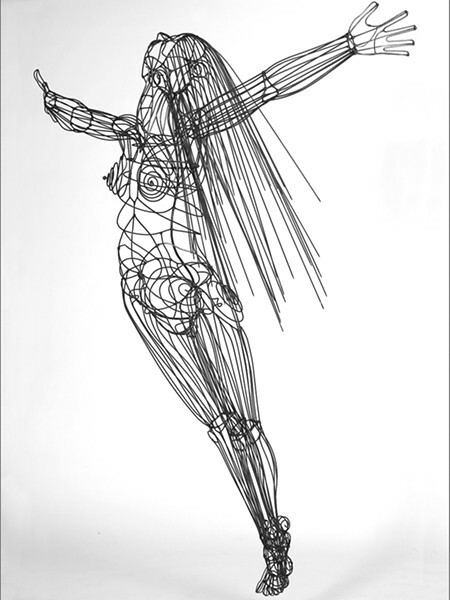 MOVING TO THE MUSIC A woman is caught mid flight in artist Michael Reddell’s sculptural piece, Flying Figure. Taking his inspiration from gestures, anatomy, and form, Reddell's pieces zero in on the smallest movement, the sort of smaller moments in between the bigger gestures. A woman holds up a globe shaped lamp with one hand in one piece, in another sculpture, Flying Figure, she's mid-flight or mid-dive depending on how the piece is hung. Three-Part Harmony invites art and music lovers alike to take another look at an unexpected intersection of sound and color that they may not have considered before. Ryah Cooley can't sing on key at rcooley@newtimesslo.com.